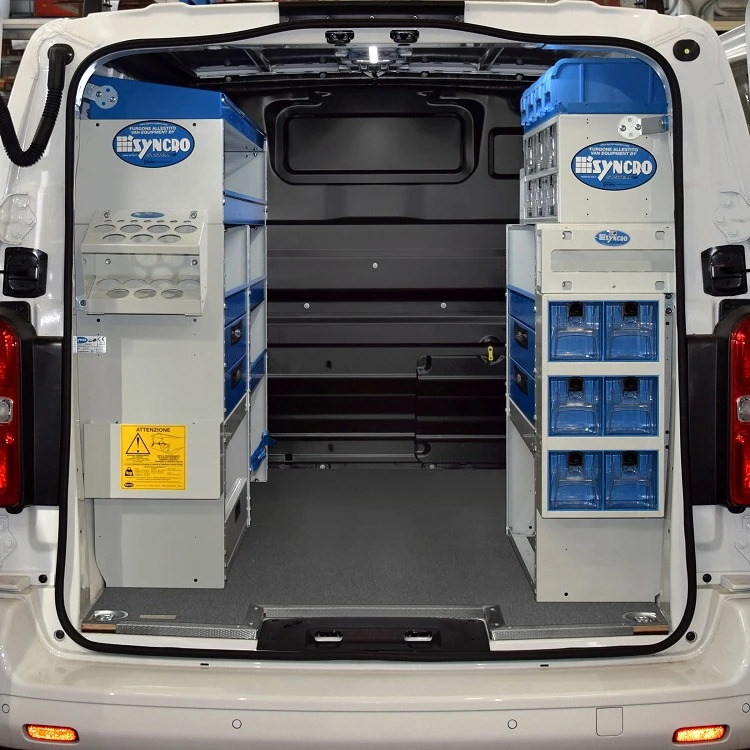 Find out how the specialists at Syncro System converted a Citroen Jumpy into a practical and efficient mobile workshop for installing electrical equipment. The Jumpy light commercial was first launched by French manufacturer Citroen back in June 1994. The medium size Jumpy was an instant sales success as it provided the perfect solution for customers seeking a vehicle that combined the easy driving attributes of a small van with a generous load capacity. The first version featured a van body with sloping walls that made it rather difficult to exploit the cargo space theoretically available. The second generation introduced in 2007 and the third launched in 2016 incorporated significant improvements to the design of the cargo space. As a result, the latest Jumpy is a thoroughly modern van that compares well with the competition. Electricians are among the customers most frequently served by Syncro System. 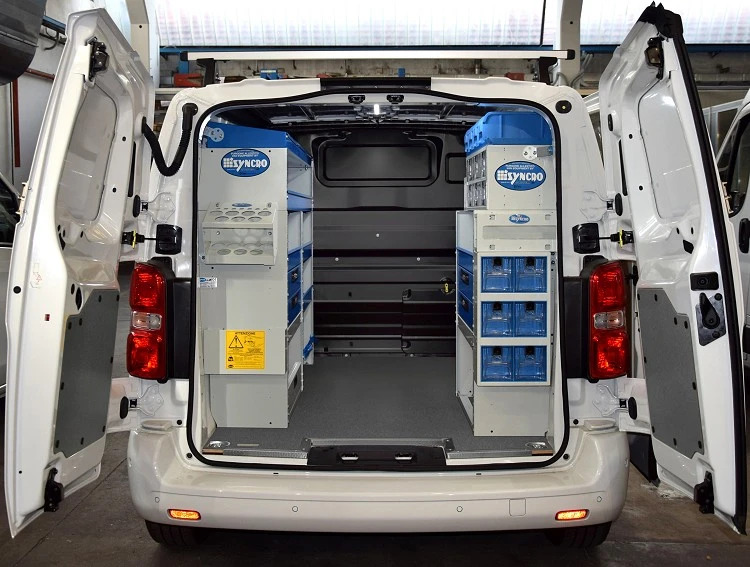 They have to do nearly all their work at the homes, offices or premises of their customers, and a van fitted out as a mobile stores and workshop is the perfect solution for travelling to the job, transporting all the necessary equipment and completing all installation, modification and repair work involved. Like all other vans, the Jumpy comes without proper protection for the bodywork of the cargo space, which can easily sustain damage as a result of cargo falling when the van is travelling or being dropped during loading and loading. The first thing the Syncro installation team did, therefore, was protect the Jumpy’s floor with a birch plywood floor liner with a marble-look resin finish. 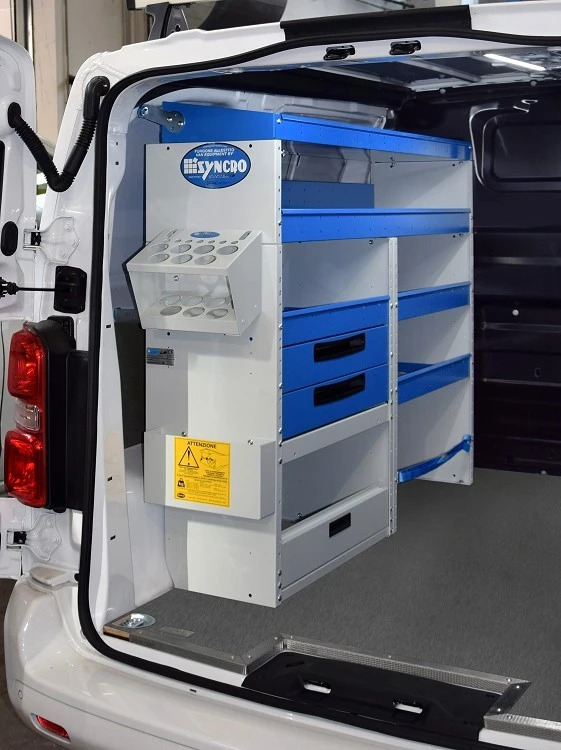 The latest Syncro liners, made from top quality plywood, feature a new marble-look finish that makes the interior of the van brighter and easier to clean. The liner in the Jumpy provides a perfectly flat surface and protects the original floor against damage. It even has non-slip stainless steel edging at the doors and cups for the original cargo anchor rings. The bottom sections of the side walls and doors were then lined with galvanised and painted steel sheet panels in an attractive grey finish, cut by laser to ensure a perfect match for the shape of the van’s body and to provide efficient protection for all areas. Working from the bottom up, the racking on the left side of the Jumpy consists of two storage compartments, with the one over the wheel arch partly closed by a patented lift-and-rotate door, a solution that provides complete access to the space inside. The compartment alongside is fitted with a strap to retain cargo. Above the wheel arch compartment are two large metal drawers on telescopic runners, with an automatic system for holding them shut incorporated in the handle. These drawers are also fitted with mats in non-slip material and metal space dividers. The racking on the left of the van is completed by four shelves, again with mats and dividers. 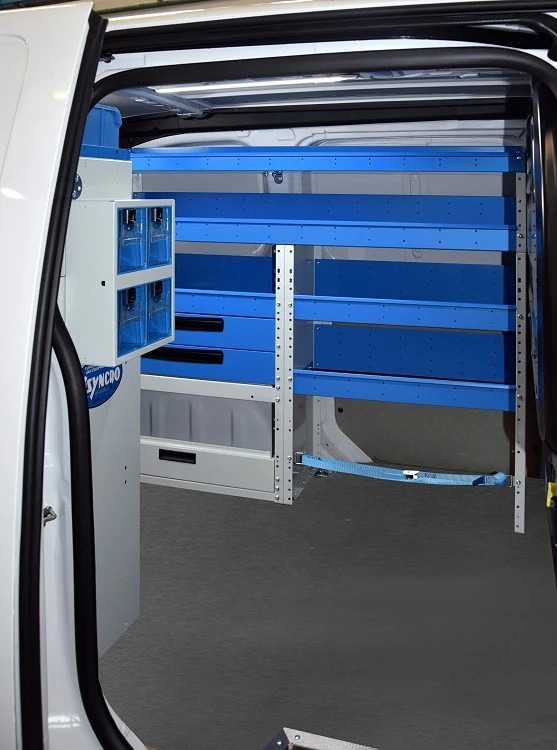 The racking on the right of the van starts with an open storage compartment at the bottom. Over this are two metal drawers like those on the left, with a shelf on top. Further up is a metal cabinet with removable transparent containers, one of Syncro’s best-selling products. The transparent drawers are made from the same ultra-tough material as aircraft windows, and let you find what you are looking for immediately. They incorporate an automatic button for holding them shut and can even be divided into four separate internal compartments. The right side racking is topped off by a tray with five removable containers in blue plastic. 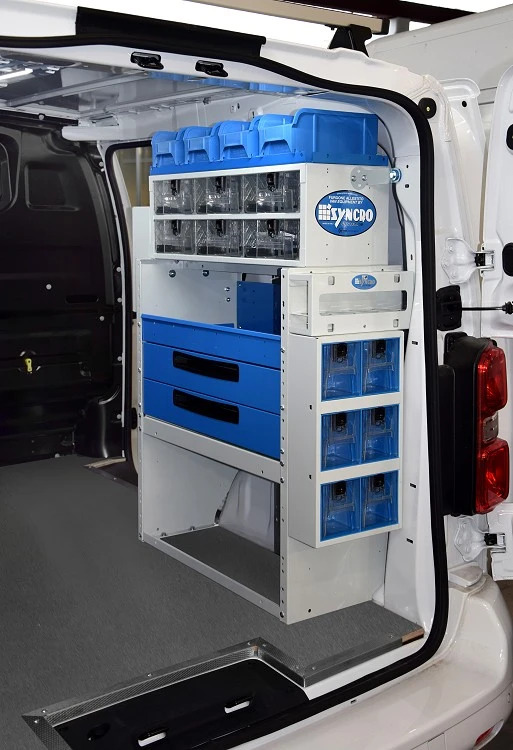 To make the Jumpy even more practical as a mobile workshop, the customer chose a number of accessories from the extensive range illustrated in the Syncro catalogue. At the back of the left side racking we can see a multi-purpose rack and an aluminium rack for silicone tubes. At the rear of the right side racking Syncro has installed a spray can rack and a metal cabinet with six tilting transparent containers, another excellent solution for keeping small parts tidy and easily visible. Last but not least, excellent lighting is provided by one of Syncro’s compact but powerful LED ceiling lights. A job well done? Syncro and the customer certainly think so!